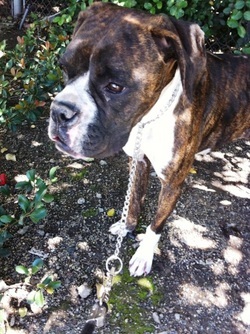 Why a beautiful, 1.5 yr old Boxer girl like Pebbles was roaming the street as a stray, captured and never claimed by the owner, we will never know. We do now that Pebbles is a gem! A Boxer thru and thru ! Celeste and Jackie freed her today from the shelter (video from Celeste, thanks, babe). She is not yet spayed. Once that is taken care off, she will be available for adoption. If you want her, fill out an application and join the club. We have the feeling, Pebbles will have many, many interested adopters knocking her door. She is that special!